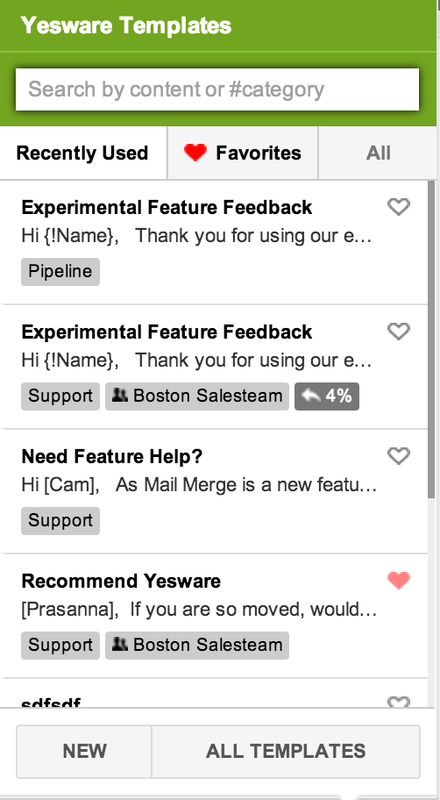 During the month of May, Yesware rolled out a slew of feature updates including a redesigned Salesforce sidebar, the repositioned inbox Dashboard, and an improved Template experience. Can you spot all the new changes? If not, keep reading. Did you know that most people spend about 28% of their workday writing emails? It’s one of the biggest reasons why hundreds of thousands of salespeople rely on Yesware Templates to get the job done, faster. Favorite Templates. Flag your most frequently used templates and save them in a single, easy to access place. Recently Used Templates. The ones you keep going back to again and again. Keyboard shortcuts. Speed things up by using CTRL-t (Macs) or ALT-t (PCs) to launch templates, and tab through all the merge fields. Use the up/down arrows to move between templates, and the enter key to insert templates. Placeholders. Quickly customize your emails by adding text and drop-down fields. Template Leaderboard. See top performing templates across your whole team. We redesigned the Salesforce sidebar so that it’s always available, wherever you are in your Gmail workspace. To make the dashboard omnipresent across all of Gmail’s views, we pinned it to the top, just below the search container. Read more about this update and why we decided to change the inbox dashboard.